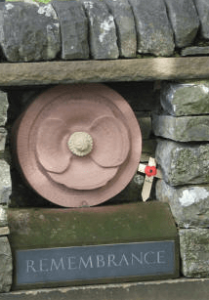 The Peak District village of Butterton, near Leek, now has its own war memorial, thanks largely to the efforts of two members of the Leek Branch of the Royal British Legion in North Staffordshire. Mrs J.E. Salt and Mrs J.U. Sumerling, both residents of Butterton and members of the W.I. came up with the idea, rallied local support and designed the memorial which was dedicated on Sunday, 20th August. Royal British Legion in North Staffordshire officials and members from Leek and other branches in North Staffordshire attended with eight Standards. The Service of Dedication was conducted by the Reverend Margaret Jackson. Eight Standards turn out for the dedicationThe memorial takes the form of a single poppy with the word ‘REMEMBRANCE’ beneath and is set in the wall of St. Bartholomew’s Church, Butterton, adjacent to the church gate. It was crafted by Mark Heaton and set in place by local craftsman, Trevor Wragg. The project was supported financially by S.R.B. (Village Facilities Grant Scheme), the Peak District Community Planning Grant Scheme, Staffordshire Moorlands Partnership and the Butterton Wakes Committee. Whilst there are no identified casualties of war from Butterton, the memorial will serve as a reminder that men and women from this small village played their part fully during the conflicts of the last century. 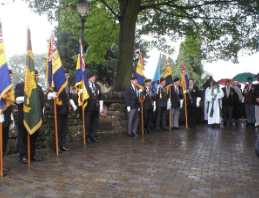 ← ANZAC remembered – Staffordshire march on!